An endless library of real estate knowledge is available right here. The following are only a small selection of great books that have been a source of knowledge and inspiration for real estate investors and landlords. At the bottom of the page, our Hot Landlord & Real Estate Books Associate Link to Amazon.com enables you to to search for great discounts on books or any merchandise you may be looking for. 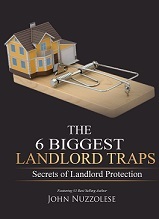 New York – New Life Vision, LLC recently announced that the book "The 6 Biggest Landlord Traps: Secrets of Landlord Protection!" by John Nuzzolese, reached # 1 on the Amazon Best Seller List, on the day the book debuted. "John has successfully rented and managed hundreds of rentals for almost 40 years. John Nuzzolese has no equal in the real estate rental space, so I am not surprised at the success of the book. John is truly the EXPERT in this space," said his publisher, TC Bradley. Discover the Landlording Secrets that have enabled John to successfully rent and manage hundreds of rentals for almost 40 years! Learn how John fell into the "Landlord Niche"
Recognize and avoid the "6 Biggest Landlord Traps"
Why you should use a "Landlord’s Lease Agreement"
or for a Limited Time, as a Special Bonus with a 6 Year LPA Membership! and The Forms to Enforce Them!" Fixed Lease Term or Month to Month? The Accidental Landlord: By Dr. Danielle Babb, national real estate expert and author is also a fellow LPA member. Everything you need to know to profit from real estate you can learn online including finding valuable properties, buyers, sellers, financing, closing solutions and more. I enjoyed Mike's book and found he makes use of many important ingredients needed to run a successful residential property management operation! - John Nuzzolese, The Landlord Protection Agency, Inc. Achieve "Massive Action" results and accomplish your business dreams! While most people operate with only three degrees of action-no action, retreat, or normal action-if you're after big goals, you don't want to settle for the ordinary. To reach the next level, you must understand the coveted 4th degree of action. 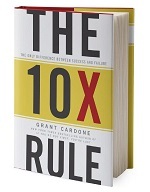 This 4th degree, also know as the 10 X Rule, is that level of action that guarantees companies and individuals realize their goals and dreams. The Millionaire Booklet was created for you to keep close to you until you become a millionaire. The eight steps Grant lays out is in a very simple to understand language that will allow you to get started today in creating the money you deserve. Let's face it, your parents didn't teach you how to get rich and the schools and colleges don't even talk about it. At a time when more and more people are slipping out of the middle class into poverty, more people are becoming rich. Just last year over 500,000 households became millionaires. The Millionaire Booklet - How to Get Super Rich now and get one for your friends and start a Millionaire Booklet Mastermind holding each other accountable until you all get there. A practical guidebook with advice, humor,stories and photos from a real landlord. Over 50 shocking color photos from tenants at their worst! The economic recession has turned many homeowners into landlords. Their neighbors and friends are doing it so why not? If everyone is doing it, it can't be that hard. But, as author Cathy Keeton Azar writes in her new book, Are You Sure You Want to Be a Landlord?, anything that seems easy and simple usually isn't. "The Out of Town Tenants"
"Jim and His Extended Family"
"The Tenant Who Liked to Shoot"
"I Need My Light Bulb Changed"
"The Tenant Who Provided Their Own Heat"
"The Tenant Who Appealed the Eviction"
The Landlord's Troubleshooter is a clear, engaging guide that covers all the bases. It pays to start with the right property by analyzing the rental market. The Landlord's Troubleshooter offers savvy advice for the hands-on investor. This do-it-yourself landlording primer addresses what to do to avoid mistakes when renting properties, and outlines the best practices of the most successful landlords. Robert Irwin is the bestselling author of more than 50 books on real estate. His career in the real estate industry encompasses more than three decades of experience as real estate broker, landlord, and consultant to lenders, agents, and investors. Robert Irwin is also a member of The Landlord Protection Agency. One of the most important elements of being successful as a landlord is the practice of proper tenant screening. As a landlord herself, Kim Herbel has learned and mastered the art of qualifying good tenant prospects and eliminating bad ones. To take advantage of a special 10% off discount coupon code for LPA members and guests, in the book checkout process, use coupon code: "LPA." I found "Landlord Marketing Secrets" interesting and thought provoking. Drew DeMasters introduces important and proven marketing ideas to the property management industry and the everyday landlord. Most landlords and property managers are unaware of these useful and effective techniques that can be easily applied to their own rental business. 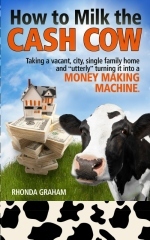 In this enjoyable and informative book Rhonda Graham shares her story and experiences of how she began turning investment homes into fine-tuned money machines by renting out rooms. From the very beginning of the rental application process, Rhonda takes us step by step through selecting tenants, managing the property and the residents to hnadling returns of security deposits. YOU HAVE LISTENED TO EVERYONE ELSE - IT IS TIME TO LISTEN TO A PROPERTY MANAGER. Most new investors contact the property manager last inside of the first thing before buying an investment. This is a mistake. Check with the people in the trenches to check on the condition of the rental market, what you should buy and not buy. As a veteran Real Estate Investor, Broker, Developer, and Property Manager, choosing the right rental home for investments is critical. I see so many investors from other areas buy in unfamiliar communities without doing their homework..
With more than a million copies in print, Robert Allen's Nothing Down for the '90s has probably helped more people achieve success in real estate than any book in history. Countless numbers of his readers are now financially independent and many actual millionaires attribute their wealth to his techniques. Why has this blockbuster bestseller been so successful? The answer is simple: it works! Now, in one of the most practical books you'll ever read, Robert Allen has created effective new wealth strategies for investing in real estate..
What! You haven't read Magic Bullets In Real Estate yet? With the volatility of the stock and bond markets in the last few years, and in view of continuing market instability due to a variety of factors ranging from federal deficit spending to the war on terrorism, real estate has become an even more attractive financial investment and/or business enterprise. Magic Bullets In Real Estate: Your Complete Guide To Understanding And Using Real Estate To Your Best Advantage by Dan Auito (a licensed real estate investor and certified appraisal assistant for the past fifteen years) will prove to be an ideal and instructive introduction to how an average person can build wealth and financial security through investing in real estate. Ably written so as to be completely accessible to non-professional general readers, Magic Bullets In Real Estate shows how to get into the real estate game with minimal investment and see immediate results; evaluating property quickly and choose only the best values; how to buy, sell, and lease properties with no real estate commissions or management fees; how to locate hassle-free tenants; how to find and rehabilitate rundown homes in a matter of days; avoiding common traps and pitfalls; preparing for and winning loan approvals; gaining access to large sums of tax-free cash for continued growth; using real estate to retire in style, and so much more. If you want to take a flyer in the real estate market, then give a very careful reading to Dan Auito's Magic Bullets In Real Estate. For those of you who are not familiar with Magic Bullets, it is a great website and forum all about real estate investing based on the the bestselling Real Estate Book by Dan Auito, Magic Bullets in Real Estate. I thoroughly enjoyed Rich Dad Poor Dad. What the rich teach their kids about money that the poor and middle class do not!- This is a "must read" for anyone who wants to be a landlord or just be successful in business. "I became a millionaire in just four years by following these same, proven formulas that are simple, effective, and are IMMEDIATE! Remember, millionaires are not smarter than you. They probably don't work harder than you. But they do know a proven way to create wealth. And so can you!" This Landlord Nightmare is a must see for anyone thinking about becoming a landlord. Michael Keaton shows you what a tenant can do to easily turn your life upside down. See the movie and learn to avoid nightmare tenants! Bronchick and Dahlstrom, real-estate professionals, teach readers how to recognize and analyze the risks inherent in investing in bargain properties, as well as the profit potential that exists in renovating and reselling such properties for cash. This all new 2nd edition reveals the little known secrets and strategies guaranteed to protect personal and business assets from any financial disaster. This "bible" of asset protection is packed with hundreds of legal tips on keeping your assets safe from creditors, ex-spouses, bankruptcy, etc. There are only a small handful of books that I can highly recommend to someone who wants to be successful in real estate investing, and "The Courage to Be Rich" is one of my top choices. It is one of the books I enjoy reading again and again. In the book, Mark O. Haroldsen instills the concept of IGDS (I'm going to die someday), driving home the fact that we all are born with a finite number of days in our lives. What we do with those days and the sooner we get started are up to us. The sooner we face that fact and summon up the courage to go after success, the better. Mark introduces in easy to understand terms, what it takes to become a real estate investor and how residential real estate investing is an excellent vehicle toward riches. He tells us about fixer uppers (yuks) and how "Yuks create big bucks". Although I first read this book in the 80's, I still enjoy it and recommend it if you are thinking of getting into the real estate investing market. This book is for owners, property managers, and resident managers. It tells how to maximize your income and resale value, minimize your expenses, and reduce the hassles of residential management. It is practical, street-smart, aggressive, and thorough. Named one of the best business books by "Library Journal", "The Landlord's Handbook" is a proven hands-on guide. The authors instruct landlords in the use of active management techniques to maximize their tax deductions and increase their bottom lines. Anyone who has ever been a landlord knows that the rental business is tightly regulated. As the authors of Every Landlord's Legal Guide point out, "a landlord either knows and follows the law or doesn't stay in business long." This book clearly outlines what the law requires of a landlord and, just as importantly, offers advice on how to be conscientious yet profitable. The Go Getter by Peter B. Kyne was first introduced to me as an audio tape from Robert Allen's "Challenge" seminar in 1987. It was fantastic motivation that I still treasure. The story of the blue vase has motivated me and encouraged me in business and life to never give up. It has inspired me to accomplish what some consider impossible tasks with the words "it shall be done" ingrained in my mind. The Greatest Salesman in the World is a tiny book, and it is a treasure. First published in 1968, Og Mandino's classic remains an invaluable guide to a philosophy of salesmanship. Mandino's clear, simple writing style supports his purpose: to make the principles of sales known to a wide audience. Anthony Robbins calls it the new science of personal achievement. You'll call it the best thing that ever happened to you. If you have ever dreamed of a better life, Unlimited Power will show you how to achieve the extraordinary quality of life you desire and deserve. Book Description To the question "Is it possible to build wealth in today's real estate market?" veteran investor Richard Jorgensen answers with an emphatic "Yes!" I first saw Les Brown on PBS television while he was giving a motivational seminar. I couldn't change the channel. He was so good. So motivating and fun to listen to, I just had to hear every word he had to say. When I saw his book, "Live your Dreams" in the bookstore, I knew I had to buy it. It was a great investment. The book is entertaining, honest, extremely enlightening and of course, motivational. I enjoy this book so much that I can't recommend it enough. Anyone who wants to go against the odds and be successful in life will need the right motivation and attitude. Les Brown's "Live your Dreams" gives you that much needed boost in moral support. - John Nuzzolese, President of The Landlord Protection Agency. For over 50 years, the rock solid, time tested advice in this book has carried thosands of now famous people up the ladder of success in their business and personal lives. This title has not yet been released. You may pre-order it now and we will deliver it to you when it arrives. Ships from and sold by Amazon.com. Gift-wrap available. for a wide variety of Landlord related books that may aid you in achieving "Maximum Landlord Protection." Then, just enter the name of the book in the Amazon Search box to locate it. The Amazon site will give you descriptions of the books, tapes, and other merchandise along with excellent pricing and speedy service to get your discounted orders to you fast.